Each of Elmer Kelton’s superb stories of the West showcase the strength and power western spirit. They are filled with marvelous characters—from a rodeo clown who seeks redemption via romance, to an outlaw who comes to the aid of ranchers with no other recourse to justice. Powerful Western women feature as importantly as the menfolk here, including a cattle buyer’s daughter who can hold her own with any man on the trail, a renowned lady outlaw who rules her gang with her gun, and a judge’s daughter who is determined to end local mob rule, as “the day of the gun is almost over.” You will meet characters whose devotions and decisions enthrall you long after you put the book down. 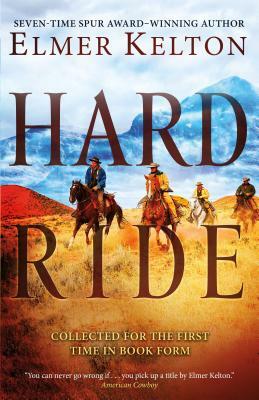 Imbued with an adventurous spirit, Hard Ride is filled with many heartfelt glimpses into the authentic experience of the American West. These stories encompass an enormous array of scenes from the early days of the Wild West into the twentieth century. Readers of all ages can enjoy these tales, each one filled with a passion for life that’s as vast as the Texas prairie. Elmer Kelton (1926-2009) was the award-winning author of more than forty novels, including The Time It Never Rained, Other Men’s Horses, Texas Standoff and Hard Trail to Follow. He grew up on a ranch near Crane, Texas, and earned a journalism degree from the University of Texas. His first novel, Hot Iron, was published in 1956. Among his awards were seven Spurs from Western Writers of America and four Western Heritage awards from the National Cowboy Hall of Fame. His novel The Good Old Boys was made into a television film starring Tommy Lee Jones. In addition to his novels, Kelton worked as an agricultural journalist for 42 years. He served in the infantry in World War II. He died in 2009.